from OrganicConsumers.org SIGN THE PETITION BELOW! I, for one, will no longer shop at Whole Foods, Buy products from Organic Valley, Stonyfield Farm or any other company that supports the use of GMO seed stock and I encourage you to do the same. If you got the chance to try Carol Román's Cuban Picadillo Pie, I'm certain you will have understood why it took the first place prize for the Savory category at the 4th Annual Brooklyn Pie Contest last weekend. It had all of the makings of a great dish: tender, flavorful, flaky crust and an abundantly meaty filling speckled with plantains, olives, raisins and spices. This is comfort food at it's finest and you could tell just by tasting it that a lot of time, love and care was poured into it. 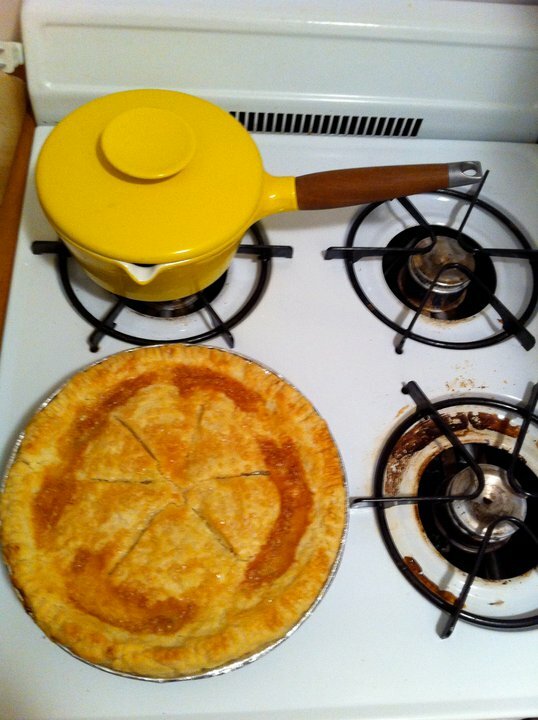 It was the perfect pie for a blustery Brooklyn night. Carol was kind enough to send the winning recipe to me to share with my readers. I hope that you all will give it a try. It's not your average pie, as it's a bit more labor intensive, but it seems like a great winter meal for a special occasion or get together. You can make your own special occasion: Invite friends over this winter, crack open a bottle of red wine and get ready to enjoy what is easily one of the best savory pies I've ever tasted! Please share your thoughts so I can pass them onto Carol. It's shockingly her first attempt at transcribing a recipe, but I think she's done a fantastic job. I hope this is just the first of many recipes she shares with us. a well seasoned steak. Add a delicious pie crust and you've got yourself a winning pie. ¡Sí señores! This recipe makes one 9 inch, deep dish style pie. butter and brush on to each plantain strip. Place strips in a single layer in a roasting pan and cover with aluminum foil. Cook the plantains in the oven at 400° for about 15 minutes or until tender. Let cool. dough onto a floured surface and with floured hands push dough together to make a thick rectangle. to rest for at least an hour. scalloped design or with a fork and cut vents on top crust. approximately 45 minutes and serve while still warm. 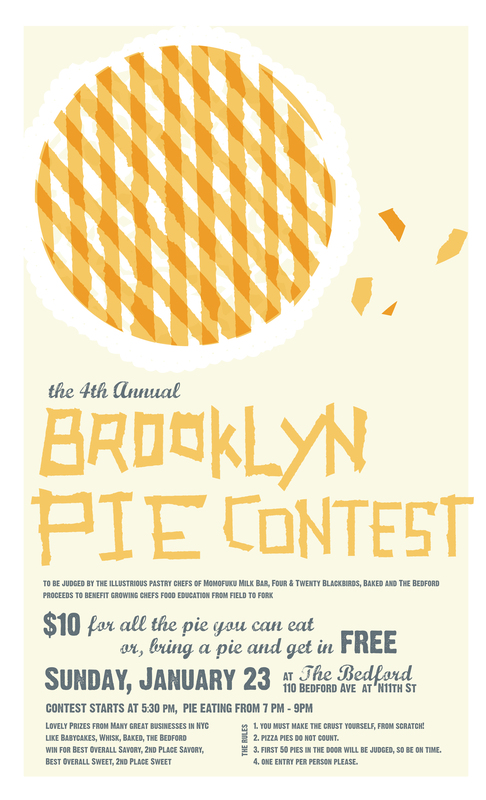 I'm just going to be forthcoming: I've spent so much of the past month obsessing and stressing over this pie contest to raise funds for Growing Chefs that I don't think I have the energy to muster talking about it much more. Fortunately for you all, when people demand information from me, I do my best to supply. I'm going to keep it short and sweet and list the winners from last night and then share their recipes throughout the week. 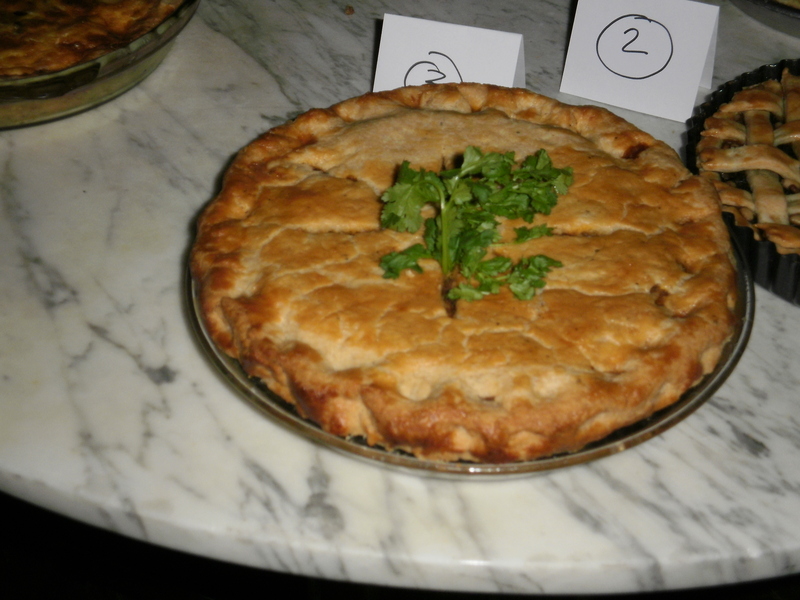 The 1st Place Sweet Prize went to an unexpected pie. Unassuming, seemingly simple at first glance, the contents of this pie plate were flavorful and balanced, all contained in an amazing buttery crust. The judges from Baked, Momofuku Milk Bar and Four & Twenty Blackbirds could all be heard over the bustling crowd groaning with contentment after their first bite. You might assume that the pie in question would be boiling over with chocolate fudge, salted caramel or some other rich and sensual ingredient but you would be incorrect. The pie that won was a simple Shaker Lemon Pie! GASP! Made from thinly sliced and sugared fresh lemons (peel and all), this pie was baked by Gerald Gold from a recipe adapted from Smitten Kitchen. Reminiscent lemon curd or marmalade, the filling was appropriately tart and sweet and enrobed in a flaky-but-firm half butter, half shortening crust. The judges were pleased by the simplicity of the finished product and fresh, vibrant flavor it provided. I definitely recommend trying out this recipe in the summertime (I plan to!). I can imagine this would be a perfect addition to a BBQ with a pitcher of iced sun tea! Great job, Gerald! With all of the stressing about money and future projects going on in my life right now I've been kind of forgetting that I've got existing projects to manage and plan for this Spring. I'm going to be heading to Newton Farm sometime in March so I'm going to have to spend as much of February as makes logical sense to get our little backyard garden and beekeeping projects throughout Brooklyn in working order. Our compost bin is currently overflowing. There's some nicely broken down humus in there capped with about 6 inches of chicken poo-speckled sawdust, leaves and veggie scraps, so as soon as there is a warm day towards the end of February, I'm going to have to go out, turn it over and shovel all of the good bits into a new bed which we are reserving for a hefty amount of herbs. We're tearing down the largest of our beds because of some structural flaws...Who knows what will go in it's place. I told Katrina we should plant some dwarf apple trees but I don't think she's sold on that. The chicken run is looking pretty haggard at the moment too. It's fairly clean smelling and cozy but just looks a mess. We started off with untreated wood mulch to fill the frame (which also needs some repairs) that is situated on top of a cement extension of the patio. Over the past year the mulch has broken down and we've turned in more of it as well as straw, sawdust, grass clippings, coffee chaff ....you name a dry, organic (and free!) material and it's been added to the run to make it clean and comfortable for the ladies. But now it's time to do an overhaul of the whole thing. All of the material on the floor of the run is coming out and going in the new compost area. We'll likely repeat the same process as before. I've also got to start planning our Spring garden! I've got to practice some real restraint this season. Since I will only be in Brooklyn half of the time, I want to be sure that I am growing low-maintenance crops for the household. In addition to not really being here as often as before, I'll be able to bring produce home with me from Newton Farm, so I want to make sure that I am not growing something that I'll already be getting from there. I'm thinking that sticking to tomatoes, herbs, beans and potatoes will be our best bet since whatever we don't eat can be stored or canned. The squirrels pretty much eat everything else anyway. Especially lettuces and kale which just happen to be my favorites. Jerks. Yes, and the bees! Oh man, how could I forget them? I've got to meet up with my lovely partners in beekeeping (non)crime, Annie Novak of Eagle Street Rooftop Farm and Stacey Murphey of BK Farmyards. February is a good time to start planning on emergency feeding your bees so that they don't starve. Truthfully, I don't think all of our hives are going to need it since we were very conservative with any harvesting we did this past summer. In any case, I will be prepping fondant for them as a precaution. Once they make it to April, Maples and Oaks will be blooming and we'll see the first bits of golden pollen coming in on the flanks of our winged friends. We then have to start preparing for swarm season. Swarms are a reproductive division of a strong colony (a good thing!) It is an intimidating sight to behold but the bees themselves are quite docile in this state. They've eaten their fill of honey to transport to a new home and for the first day or so after swarming, it's actually quite difficult for them to extend their stinger. All that aside, since we live in a densely populated area, I want to do my best to keep this from happening. My plan is to do some early alleviation of crowding in the brood nest, perhaps make some splits and set up a couple of bait nucs for good measure. Heck, maybe the bait nucs will catch someone else's swarming bees! That could be kind of cool. I'm super fortunate this year because I've taken on two very wonderful and dedicated beekeeping apprentices that started working with me this past Summer. Nicole and Patricia will be learning hands-on all season how to inspect beehives, diagnose illnesses and identify pests, harvest honey and lots more. It will be great to be able to call on some folks to go check on some hives in a pinch if I won't be nearby. I'll tell you more about these fantastic ladies in a future post. And that's about it. I guess I should quit blathering on about it and get cracking, eh? Times have been pretty lean for me since May. Leaving the security of a salaried job with benefits during the worst recession of my lifetime was a pretty risky decision. When you consider that I left to pursue a career in beekeeping and backyard homesteading... Well, you may as well strap a straight jacket on me because it's totally crazy. I had no idea what I was doing. Still don't. But when my gut speaks, I often take heed. My instincts haven't lead me astray so far. Since the start of my self-imposed foray into the world of underemployment I've taken on some random jobs here and there. Babysitting, selling high-end kitchen supplies in a cool Brooklyn shop, social media consulting. Each experience had it's merit. I've met really wonderful people, had some laughs, made some money, but ultimately it always led to this nagging feeling that I was being distracted from my goal: To learn everything I can about growing food any apply it to my life, wherever I am. And to find someone to pay me to talk about it so I can keep a roof over my head. It sounds much less noble when I put it in terms of monetary compensation, but it's the truth. It's expensive to live here, but I AM here so I have to make it work. I refuse to be distracted further from that goal, but since then the quality of my life has take a few hits. I think I've done a pretty good job of making do. I mean, right now I have $75 in my bank account until some checks start rolling in (which any freelancer knows happens whenever people get around to writing 'em) but my pantry is full for now and I've got a great companion in Neil who gives me tremendous moral support. For some odd reason he tells me he is proud of me, often. It's a considerable comfort when most other things in my life feel so tenuous and uncertain. I've never before been as poor as I am right now, but I feel pretty lucky. Every day I get to wake up in a warm bed with some soft, fat cats on my belly purring for their breakfast and a lanky, wonderful bean by my side. I eat well most days either by my own hand or by the hands of my talented and generous circle of food-centric comrades. I have great friends that look out for me and throw promising opportunities my way. And by and large they are great ones that have the potential to help me keep my head above water. Ah, opportunities! The future! That is what excites me most about my life currently. 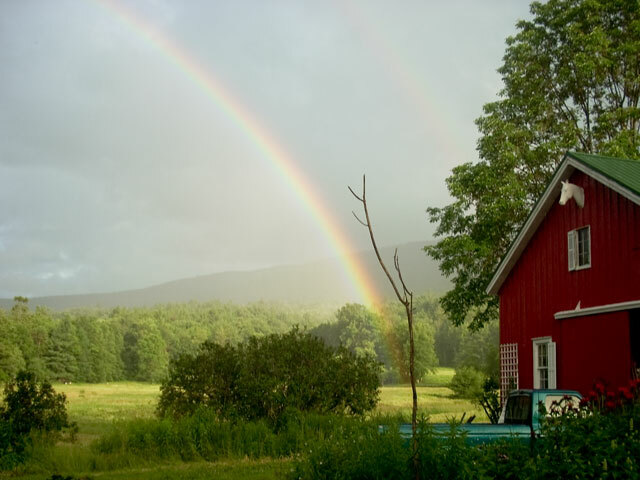 I'm happy to announce that starting in March I will be dividing my time between Brooklyn and Newton Farm up in the Catskill Valley. I'll be working with Lynn Loflin, a long-time NYC restaurateur, and her partner Rupert Newton to grow vegetables, raise fifty egg-laying hens and start up some country beehives for honey and pollination. In addition, I'll be keeping bees for a well-known hospitality group in the area, teaching classes as often as possible and possibly writing a book, provided anyone would want to read what I have to say about anything. So that's a pretty good start, right? Can I stop being scared shitless now and just enjoy what's coming? It's on y'all! Make sure you read the rules before you show up! I'm going to just come out and say it: I don't believe in "resolutions". Most of the time a resolution is nothing more than a goal that you didn't care enough about to reach the year previously. If I really cared about losing 10 lbs or learning to play chess, I wouldn't wait around for the rigidity and high rate of failure that comes with a New Years Resolution. That is just me, though. If I want to do something, I do it. I don't need a new year to motivate me to get'r dun. That being said, I feel really good about last year. Individual progress had been made in leaps and bounds. I've become better at a lot of things, made a great number of truly wonderful friends and acquaintances, failed at some things but LEARNED A LOT in the process. I took a big risk quitting my well-paying and secure job during a recession and found that "money comes easily and frequently" if you are willing to work smart, improvise and hustle a little. The focus of 2011 for me will be in building on what I've already got going, keeping up the momentum. At first I thought that making money would be more beneficial and wise goal, but I've realized in recent months that if I make profits the impetus for hard work, my heart suffers for it. Not to say that being fiscally solvent is not something I desire. I do desire it. But I also know one thing about myself that is true above all things: I am resilient and resourceful. If I need money, I'll find a way to get it. But now, I will focus on becoming the person I dream of being. As you can see below, my goals all follow the progress I've been making and direction that I've already been heading. -Create the most bangin' home office so I can write my book in relative comfort. -Raise and slaughter some chickens and rabbits and make something delicious with them so as to honor their sacrifice properly. -Develop my skills as an instructor and continue to inspire anyone and everyone to take up growing food in whatever capacity they can! -Get massages as often as needed and brush my teeth before bed EVERY night.